The following post is a critical response to a communiqué from the black bloc: ‘Greenpeace-Greenpolice’ (available here) which contested the role of ecology in political demonstrations taking place around the recent COP 15 Summit with the intention of drawing support away from the Reclaim Power action at the Bella Centre on the 16th December. I was glad to see that the 'Greenpeace-Greenpolice' document had been posted up on Indymedia. I first encountered it on one of the large organisational meetings at Ragnhildgade a day or two before the Reclaim Power action in Copenhagen, and it was given to me as an anonymous handout without any explanation. Two things struck me about it on my initial reading: firstly, that it was a well-written piece of postmodern sophistry, and secondly, that it may have been disseminated as deliberate 'misinformation' by some covert E.U. intelligence service, as a means to confuse, divide, and conquer the gathering protest movement against COP 15. Now that we know it was composed by someone associated with the black bloc and the reason for its publication we can a bit less paranoid about it. I also attended the Copenhagen Climate Justice protest on Saturday 12th December; I wanted to be involved in the action so I stayed close to the black bloc. At the beginning, I was walking with the 'System Change' section of the procession when the sound-bombs went off, and I must have narrowly missed out on getting a ‘preventative arrest’ with the other nine hundred that day. But I wasn't aware that black bloc members were physically prevented from joining the non-violent ‘System Change’ protesters, and if they were refused entry into the ‘non-violent’ section by the Climate Justice Now organisers then that's clearly a bad move politically, even if we accept that there were undoubtedly agent provocateurs amongst us who had orders to disrupt the peaceful protest, and that every political movement must occasionally discipline its own forces to comply with the plan of action. Yet I never heard anyone discuss this ‘refusing entry’ incident during the course of the following week, which certainly doesn’t mean that it didn’t happen. What I did hear afterwards were one or two people arguing that the whole procession should have stayed behind in support of those innocent protestors held under ‘preventative arrest’. Perhaps if the hundred thousand people had stayed in one spot and demanded their release the riot police would have had to back down, and that might have been a highly symbolic victory for the protestors. Personally, I would have preferred it if the protest had taken this direction, that would have been much more interesting; as it turned out the Saturday peaceful protest was a dull trek through town occasionally enlivened by the odd sound system or samba band, culminating in some well-intentioned but rather feeble speeches which were palpably ineffective as a political strategy. But as far as my limited understanding of the black bloc as a protest tactic, I'm all for it. They offer much needed protection from the riot police who will try and intimidate the non-violent protestors into giving up, and they also inspire courage in inexperienced protestors who are not used to seeing the violent side of state-power. I think protests need this ‘antagonistic edge’ which the black bloc has now come to represent, and this mode of political resistance is essential to prove that sometimes, through determination and sheer strength in numbers, the people can effectively surmount state-power and expand the scope of what is politically possible, at least for long enough to apply pressure on a particular issue (think poll tax riots). But in my view the black bloc’s activities must ultimately filter in with the broader counter-hegemonic struggle against exploitative neoliberal governments. 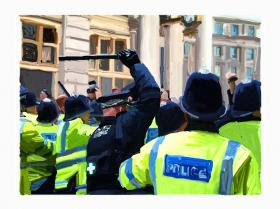 Whether this effective surmounting of state-power is expressed through closing down the financial district of a city centre or through inflicting collateral damage on a symbolic piece of private property, this will all depend on what is tactically viable on the day. The point is that these activities should make people question why it might be right to occasionally break a shop window, or shove back a riot police who is violently trying to prevent government delegates from joining the activists outside and forming a 'People's Assembly'. Whilst a protest can be rendered ineffective if the media coverage only concentrates on the question of what degree of police brutality is necessary to prevent a broken window, it’s also true that protests which lack a black bloc element-(regardless of what colours the activists wear on the day)-fail to attract significant media coverage and can appear to the public as a contained and powerless display of affected politics. In contrast, an effective protest is one which manages to reveal the real weaknesses in state-power through direct actions which generate media interest, and inspire a broader public into getting directly involved with the political issues which affect them. It is the possibility of success, rather than the occasional acts of violence or vandalism, which is arguably the most thrilling aspect of direct action. During the COP 15 protests many of the most intelligent and inspired people I met were associated with the black bloc-and they were certainly the most defiant. 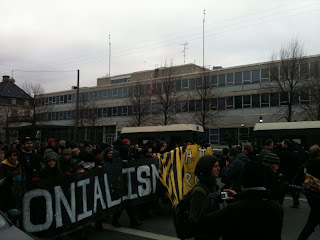 On the 16th December, inside the controversial rabbit cages which the Danish police had purpose-built for the protestors at Valby, the black bloc arrestees managed to tear up the internal walls of their cells in active rebellion against the riot police, who in turn would repeatedly carry out their threat to pepper-spray them inside their cells-but the prisoners persisted with their action, demonstrating that their political convictions were more powerful than the legal violence of the state. In the cells that day there was also good discussion about the current relevance of black bloc tactics-about whether the sporadic vandalism of the black bloc did more harm than good for the Climate Justice movement. Yet for me, this isn't even a question: the black bloc anarchist wing of the movement are vital to have onside for the reasons given above, and they're not genetically determined to be a nuisance nor psychically programmed to throw a brick every five minutes. If there's the possibility of making a great direct action so long as they can keep strategically inconspicuous in the meantime then of course that’s compatible with their general objectives. Currently, the main thing which unites all protest blocs is our shared objective of trying to throw a huge spanner in the works of neoliberal government, at a time when it’s most vulnerable, to show people that an alternative politics is both possible, and preferable. This will require organised collective action. Yet the 'Greenpeace-Greenpolice' communique seems to argue that no one political situation is preferable to another. Its appeal to conserve a 'living excess' from the reach of all political calculations does so only at the expense of precluding any means of measuring the value of different social organisations (of people, of other forms of life, of a political ecology). And, if there's no way of rationally deducing which kind of political organisation is preferable over another then we may as well give in to our intuitions now and do whatever feels best, whether that means throwing a brick through a window, or throwing in the towel, or both at the same time. Argument: Suggests that we should feel suspicious about the similarity of the rhetoric of those organising the COP 15 and those organising the protest: rhetorically at least, they appear similar. Refutation: Rhetorical similarities are merely that: One must still rely on words like ‘freedom’ or ‘power’ even if these words are also used by the Nazi’s or George Bush. Argument: Despite stylistic differences, both COP 15 organisers and protest organisers rely on similar institutional spaces and communicative technologies as a means of achieving political organisation; therefore, they may both be equally culpable as oppressive powers which limit human freedom. Refutation: Although both COP 15 organisers and protest organisers utilise similar institutional spaces and communicative technologies, this does not mean that their respective politics are by any means equivalent. Political positions are determined by a set of scientific and metaphysical convictions which ground them. For example, a neoliberal capitalist might argue that competition and free-markets are the best way of enabling life to flourish on this planet, whilst a social ecologist might contend that there are more reliable means of making life flourish than the loaded dice of the free- market. It depends on which argument you find most convincing after considering the evidence, and this is the essence of what forms a political view. As for human freedom being something outside of politics, then one should also be free to participate in a collective political action, and perhaps we are more emancipated through the collective organisation of our environment rather than through an individual’s crude struggle against nature or society. Argument: Questions whether the protest may itself be a part of the state system, which is allowed to exist to represent 'political resistance' without actually doing so. Furthermore, it implies that by actively struggling against the media spectacle of the COP 15, protestors are inadvertently legitimating its existence as a political forum. What does it mean to want to save humanity? From who, or from what? For who, and for what? If all political positions share the singular aim of saving humanity, then this could nullify all political conflict, which may be essential to a healthy human culture. Refutation: The protest is in an antagonistic relation to the state: it is not outside or isolated from it, in the same way that the politicians inside the COP 15 were equally human with those who were outside it. This needn’t be cause for concern. It’s true that the COP 15 protest also drew attention to the COP 15 conference, but this was because a serious political struggle was taking place over who represents the real interests of the environment along with a concern for the future generations who will live in it and be subject to the undemocratic policies being decided upon inside the Bella Centre. That the environment has become an issue which can no longer be swept under the red carpet is partly due to grass-roots political activists raising awareness on these environmental issues. That’s why it was crucial for activists involved in these issues to try and make their voices heard with whatever means were at their disposal: brute force and old media dominance for the neoliberal western governments, genuine popular support along with creative means of enticing the media for those associated with the Climate Justice movement. The abstract question of what it means to ‘save humanity’ can easily turn into a theoretical dead-end if it paralyses the possibility for direct action; neoliberal capitalists might have one idea of what it means to save humanity, whilst the anarchists clearly have another. It’s up to everyone to consider the evidence and decide on what is right. Afterwards, individual opinions may coalesce into differing political groupings and that’s how united political struggles are born. There is nothing sinister about the fact that opposing political groupings can both claim to be saving humanity. Both the rhetoric of George Bush and the anarchists claim to be standing up for individual freedom, but their political struggle for organising a society in which individual freedom can flourish is premised upon entirely different conceptions of what it means to be free and how it might be manifested here on earth. Just as there is a world of difference between George Bush’s means of defending freedom and an anarchist’s conception of the free individual, theoretically anarchist politics should have much more in common with the protest movements than those delegates representing neoliberal governments inside the COP 15. Sometimes it’s necessary to join forces with your enemy’s enemy and leave the theoretical discussion until later. The Reclaim Power action was one such occasion. Argument: The COP 15 is the most recent example of an emerging ‘managerial turn’ in contemporary politics. This managerial turn allegedly seeks to measure and quantify all former political externalities (such as social life, environmental concerns, and even resistance itself) in order to incorporate it into a more complete state dominance. Yet there is something immeasurable within the field of state-power which cannot be reduced into any objective schema: the living excess. Refutation: It’s correct to state that there has been what could be termed a managerial turn in neoliberal western governments, which now concentrate on managing the growing incorporation of free-market competition into all spheres of life, rather than claiming to represent a distinct political position. This is because we have all accepted that free-market capitalism and individualism is the most liberating means for organising society, right? The argument that there is something ineffable about human life which exists outside all objective modes of analysis makes truth a relative concept and inadvertently plays into the hands of neoliberal ideologists, to the extent that it can sometimes justify the reduction of the state (that’s welfare, education, and health, as well as police, armaments, and prisons; although in practice it’s usually the former that faces the cut-backs) and consolidates the present inequalities in society as being a product of that ineffable difference between individuals: some people are just born to rule. Argument: Ecology has come to function like a ‘universal religion’ and one should be suspicious of the fact that all political positions are trying to claim its authority. To be a political activist for the environment is ultimately a matter of submitting yourself to a tyrannical future goal, which in the process sacrifices all that is valuable about our essential humanity. If ecology is concerned with environmental equilibrium, then isn’t this analogous to an oppressive politics which quietens all dissent? Furthermore, it teaches us to distrust our own inner human nature, even causing us to ‘police’ ourselves. Refutation: One doesn’t need to be suspicious of a word, although one might benefit by examining its differing uses before categorically condemning it. Differing interpretations of the concept of ecology are part of a political struggle. One conception of ecology, such as James Lovelock’s ‘Gaia Theory’, may argue that the earth will always find its own ‘equilibrium’ and that it’s pure hubris for human-beings to try and prevent climate change. This conception results in a political position known as ‘quietism’, which contends that future-orientated political projects are against the natural tendencies of human beings, whilst what is natural for us just so happens to be how things currently stand. Another conception of ecology, such as the one articulated by Barry Commoner in ‘The Closing Cycle’, might argue that our shared reliance on the earth’s finite resources ought to be the thing which unifies us as a species and inspires us to protect the natural ecology of the planet for the good by ensuring the biodiversity of life. This conception of ecology results in a political position which has been termed ‘eco-socialism’; it relies on the conviction that we can all work together for the common good and that collectively we can reach agreements and define the nature of this common good. The argument that all political commitment to a future-oriented goal sacrifices ‘everything that makes life worth living’ is as infantile as arguing that peeing in your pants is an active rebellion against the tyranny of the toilet bowl. We all ‘police’ ourselves to some degree-and this only has a nominal relation to the way in which actual police forces may or may not serve to further the interests of oppressive governing powers. Insinuation: If the success of the COP 15 summit in some ways depends upon popular interest, then perhaps we shouldn’t give it any attention or go anywhere near it? Implication: The failure to significantly breach the Bella Centre perimeter fence was partly a result of the split starting points of the Green, Blue and Black blocs. Perhaps if we had started out from the same station then we may have managed to hold back the police for longer and create a ‘cop-free’ autonomous zone for the ‘people’s assembly’ to take place. Insinuation: And if the police are the new essence of global politics, then shouldn’t we renounce all politics? Implication: The exceptionalist understanding of politics as something which occurs only outside of the established channels enables those parties in power to maintain their grip whilst the possibility for resistance withdraws-and diminishes. By way of conclusion, I’d like to again re-emphasise that I think that this communiqué from the black bloc has a very seductive argument which I imagine could easily confuse those who lack the theoretical sophistication of its author. Regardless of the intentions behind the piece, I imagine it must have been music to the ears of those undercover police agents who attended the organisational meetings. Of course there should always be room for opposition within any political movement, and the author of this communiqué is right to question the rhetoric of ecology when all colours of the political spectrum are claiming it for themselves. Likewise, the reasons behind the various struggles which made up the protest movements surrounding the COP 15 can not be subsumed under the theme of ‘ecological concern’ no matter how it’s defined. Nevertheless, in my view, it is only by collective action and careful strategising that we can reveal the weaknesses in state-power, and it’s only through collective organisation that we can construct a political ecology in which ‘the free development of each is the condition for the free development of all’. Fresh from a trollish critique of Ray Brassier and the invention of experience (the philosophical equivalent of walking into a crowded bar and punching the tallest guy on the nose in the hope of earning a free drink) the Philosophe sans Oeuvre now turns its critical gaze onto the emerging consensus which surrounds the alleged failings of the G20 Meltdown. Ever since this post at K Punk first divined the current redundancy of large-scale protests, a growing number of theorists on the left have taken this wisdom on board as an established fact. It is now common knowledge that the G20 Meltdown was for all concerned ‘little more than a feel-good feel-bad activity’, and ‘made a sum total of zero difference’; except to show us ‘the futility of the dominant mode of contemporary protest’ and prove that a new ‘theory is necessary to move it past its current impediments’. What we, the theorists need, is more thinking, and not the thoughtless action of the people. Could this ‘K Punk Consensus’ on the futility of public protest be of a piece with Brassier’s new Platonism for the people? If the consequences of Brassier’s extant political work appears to require a philosopher-king who directly intervenes in our species-being (all according to rational, scientific criteria of course), then K Punk’s denigrations of public protest in favour of a new ‘Platonism for the Party’ would seem like a fitting structural analogue. In both cases what we have is the promise of an ideal political-science justifying a dis-engagement from politics in the present on the grounds that not enough people are presently engaged with politics. But whether the Singularity will arrive before the end of the world is a moot point; the circular reasoning of theoretical containment however, is pure kettle logic. In Jokes and their Relation to the Unconscious, Freud uses the example of the ‘kettle joke’ as a means to illustrate the way in which an analyst can uncover a repression in their patient through observing the contradictions in their account of an event. The joke involves someone lending a kettle to a neighbour and then, after a month or so, asking for it back. The neighbour responds by explaining to them how a) the kettle hasn’t got a hole in it, b) the hole was already there when the kettle was lent to them, and c) the kettle was never lent to them in the first place. Each of these excuses may be separately plausible but together they rule each other out and prove that, really, the neighbour feels guilty about the broken kettle. With the ‘K Punk consensus’, we are led to believe that large-scale public protests are futile because a) they are just mass organisations of a revolutionary public which achieve no real political change, b) they are just expressions of a revolutionary public which lacks real political organisation, and c) they are neither real political organisations or expressions of a real revolutionary public, but instead, the G20 Meltdown protest functions like a return of the repressed in their political unconscious, which thus far appears to lack either a coherent objective, strategy, or subject. The debilitating consequences of such a theoretical standpoint are plain; but thankfully politics, much like the practice of science, does not wait for philosophical vindication, and nor does it remain penned-in by some bad joke of a theory. 1) There is no point in having a theory of political resistance which has an a priori stance against public protest. 2) There is no point in criticising a political strategy when you do not offer a political strategy or a political subject to replace it. 3) The folk-psychological reading of the protest is a facile interpretation of a complex event and grossly patronising to those that took part. 4) The failure to sustain popular interest in the protest was partly caused by the ‘neutral coverage’ of the old media in collusion with the negative assessments of its new media spokesmen. 5) Those who attended the protest represent the real grass-roots anti-capitalist movement and any political theory which aligns itself on the Left should seek to draw on their support. 6) The environmentalist wing of the anti-capitalist movement plays a vital role in raising awareness of the severity of ecological damage caused by our contemporary mode of production, and is increasingly successful at drawing in new support for the Left. 7) The G20 Meltdown was ‘the most expensive protest in British history’, which is a good indication of its real potential: the British government could not afford to have another one like it. 8) The protest was an attempt to utilise the two great weapons that current circumstances have afforded the anti-capitalist movement: the use of communicative technologies as a means of rapid mobilization, and the reliance on new media coverage as a means of circumventing the older ideological organs of the state. 9) Occurring at a sensitive moment for neoliberalism, the G20 Meltdown protest was a novel configuration of different political causes combining to form what will eventually become ‘a genuinely combustible new left’. Philosophe sans Oeuvre: Can you briefly introduce yourself in terms of your philosophical background, your political standpoint, and your current projects. Paul Reed: I’m Paul Reed, one of the co-organsiers of the monthly Radical Theory Group which was previously based at rampART until the recent eviction, but is now currently located at the LARC, and runs on the first Friday of every month from 6 o’ clock. What’s great about this reading group is that it manages to draw in a wide cross-section of the general public who are interested in learning about political theory, rather than just the usual students and academics. This month it’s the turn of Foucault and The Birth of Biopolitics-everyone is welcome to attend. As an undergraduate, I studied for a degree in English Literature before moving on to study history with Paul Gilroy at Queen Mary. My current doctoral research explores the relationship between the ‘blat’ economics of the late Soviet Union with the growth of new social movements which exist between the interstices of neoliberal governments. Basically, my guiding question is to what extent does the growth of these social movements (such as ‘squatting’, ‘free schooling’, etc) depend upon the current political system, and in what ways can they effectively challenge it. PSO: Can you give us an overview of your personal experience at the G20 Meltdown Protest? PR: Sure. I arrived at the protest outside the Bank of England with a photographer friend of mine just as the police were beginning to seal off the area, around 1 o’ clock. We got some great pictures of police horses being forced to step over sitting protesters who were trying to keep open the access to the demonstration; inevitably one of the protesters gets trodden on, but they didn’t move until the police dragged them off. I was also quite close by when we heard the jubilant roar of the crowd as the windows of the Royal Bank of Scotland were caved in. It was an exhilarating moment: at that point it was still early in the day and nobody knew where the demonstration was going to end up; all we knew was that there were a lot of angry-looking riot police and a lot of smiling protestors. Soon afterwards we ended up getting forced out of the area by police, and after a few failed attempts to get back in through the kettle we ended up recuperating for most of the afternoon in what can only be described as the ‘fluffy’ climate camp. Initially, the climate camp protest appeared to have all the political content of a ‘back to the sixties’ postmodern parody, with its obligatory tree-huggers, samba band, and cool ‘chill-out’ zone. Yet it was there I would witness the most courageous acts of resistance during the whole demonstration. Around 6 o’ clock, the now kettled and overcrowded climate camp was invaded by the riot police, who waded in swinging batons and using their shields to shove people over. But, amazingly, the protesters didn’t panic; instead, they literally stood up to them with their hands in the air, forcing the riot police to strike at non-aggressive citizens if they wanted to take over the protest space. This they did, but would stop after a while, presumably because it could have looked very bad for them if word got out to the media. Before then my friend would get struck on the hand for his trouble, and I saw young girls getting beaten back by police truncheons. But it was their courage which kept the Climate Camp going and prevented the protest as a whole from being broken up much earlier. In the end, the riot police decided to kettle us in until the nearby solidarity protests had subsided, before finally letting most of us stagger home around midnight, while packs of police continued to hunt down the few remaining protesters through the streets. PSO: Can you summarise what you think were the main positive outcomes from the G20 Meltdown protest? PR: Happily. Firstly, and contrary to received opinion, the protest struck its target in a very direct way: it cost the government and the financial centre of London a serious amount of money. So whilst it might have looked like a harmless spectacle to those viewers at home, for those who were forced to cancel work and pay for security it was a very different story. Using a kettle not only contains heat, it stirs it up, and costs the system a lot of energy, and if the Daily Telegraph acknowledges the G20 Meltdown protest as ‘the most expensive police operation in British history’ then you don’t need to be a brain surgeon to figure out that a few more of these costly protests and the government might reconsider its policies, because it’s a very sensitive time for neoliberal administrations right now. Secondly, I don’t think we should underrate the value of the experience for those involved. Watching the Royal Bank of Scotland get its windows smashed in; watching teenage protesters stand up and defend their camp site from an illegal invasion by heavily armed riot police-it certainly demonstrated the growing strength of public dissent. What was interesting about this protest was that, unlike the Stop the War movement which was always dominated by the Socialist Worker Party, the G20 Meltdown seemed to bring out a new configuration of political resistance, mobilised by the fall-out from the credit crunch. This is conjectural, but to me at least there seemed to be a greater diversity of people involved in this protest than I’ve seen before at demonstrations, ranging from rebellious school children skiving off from school to unemployed city bankers who wanted to find out what was going on. I hoped they learned something about the vulnerability of a government which needs to police a public demonstration with such violence. And no-one will forget about the manslaughter of Ian Tomlinson. I realise this is in bad taste, but there's a bitter irony in the fact that up until the death of one of their newspaper sellers, the Evening Standard had been wholly supportive of the London Metropolitan police. Lastly, and without wanting to trivialise the event as some kind of networking opportunity, I think the protest should be remembered as a kind of practical unification of what Owen Hatherley has called ‘a genuinely combustible new left’. It’s irrelevant whether many of the protestors knew which policies were being decided upon at the G20 summit, and it really doesn’t matter if everyone who was present had previously agreed upon a stable set of non-contradictory demands. I think the protest has a kind of emergent logic of its own, in which the different issues of the protesters all coalesced around a legitimate critique of how things currently stand. Of course, it’s up to the political theorists to find a way of coherently articulating and reinforcing these demands, but this can only happen after the event. PSO: What do you say to those theorists on the left who would argue that for all its good intentions, recent large-scale public protests have achieved nothing concrete or sustainable? As an example, the Stop the War movement has the record for the largest public protest in British history, and yet it has completely failed to achieve its stated aim. Similarly, and despite coinciding with a particularly vulnerable moment in the history of neoliberalism, there hasn’t been any noticeable change for the better in our government’s economic policies since the G20 Meltdown protest. PR: I’m tempted to respond with the quip which Mao gave when asked about the French Revolution: ‘it’s still too early to tell’. But in a way this is true for the G20 protest: one cannot assess the concrete effects of a revolutionary event according to the standard measures of party politics. The one original aspect of the protest, which to my knowledge no-one has yet really picked up on, was the now integral role of new media technology in contemporary political activism. It’s easy to criticise the protest as one big spectacle, but isn’t there something encouraging about the fact that it stimulated so much media interest? Never has a protest been photographed so much; never has a protest been given so much instant relay to the general public through new media technology. Doesn’t this at least demonstrate that the people are interested in a revolutionary politics? Of course you can interpret this ‘interest’ in a positive or a pejorative sense. During the actual protest I’d naively hoped that all this instantaneous media coverage would somehow set off a kind of chain reaction enabling the protest to spread. Perhaps the police also feared this too, which would explain why they were using the dubious Section 76 of the Counter Terrorism Act to intimidate photographers into deleting their footage. The fact that there were more photographers than policemen also had some immediately practical benefits too. Effectively they restrained the police from becoming too brutal, and when they did manage to kill someone then there was a camera around to see exactly how they did it, and so that’s how we all got to see the appalling footage of Ian Tomlinson’s death. It’s also instructive to recall how it wasn’t the liberal media who brought the manslaughter of Ian Tomlinson to public attention. Until those private videos surfaced, the BBC and the liberal broadsheets had managed to studiously avoid the widespread police brutality on display at the protest in favour of their usual ‘neutral coverage’; which basically meant portraying the whole thing as the work of a few hundred blood-crazed anarchists trying to break into the Bank of England. In fact, I’d go so far as to argue that despite the great efforts of the organisers to publicise the event, and in particular the ingenious showmanship of Chris Knight who delighted reporters with his jokes about hanging bankers from lamp-posts, the key reason why the G20 Meltdown became such a damp fuse was due to the lack of support from both the old and the new media. In the same way that the police will always deliberately underestimate the attendence figures of a political protest in order to downplay its significance, the closed ranks of the old-media coincided with the cynical views of the new left, and both were equally to blame for the still birth of the protest. There’s a kind of hyper-Orwellian aspect to all this, in which resistance is no longer just incorporated into the state, but now actively supports it. Perhaps the most disturbing aspect of Orwell’s 1984 was not the idea of a Thought Police or a Room 101, but the sinister ambiguity of the Brotherhood resistance movement: Orwell never reveals whether the Brotherhood actually exists whilst being unable to effectively resist the state, or whether it’s just a state invention which functions as a kind of bait to catch potential resistors. The dismissive presentation of the G20 Meltdown in the new media is like an even more ingenious version of this trap, only now this genuine site of resistance to the state can-with the best of intentions- actively strengthen its power. PSO: It has been argued that a key reason for the failure of the G20 Meltdown was mainly due to the fact that the general public were shrewd enough to see that the spectacle of protest was just that: the usual suspects indulging in a display of affective politics. The protest may have made the few activists who attended it feel like they were doing something worthwhile, but to the rest of the country it was just a naïve and insignificant spectacle which cost them a lot of money. PR: I don’t deny myself the affective dimension of politics, whether it’s from the sense of enthusiasm I felt on the morning of the protest, or the anger I felt when I saw young girls at the climate camp getting beaten with truncheons by the riot police. By the time we got let out of the kettle around midnight, my overall impression was that these kinds of protest are simply barbaric: very soon it became little fun for either the protesters or the police (although clearly the unarmed protesters had a much harder time of it if we compare injuries). But protests are necessary. It’s sad that we still have to stoop to this level in order to make a point, but hasn’t it always been this way? Those in power will do all they can to prevent their privileges from being taken away from them, and likewise, there’s nothing ‘moral’ about the protestors who are there to fight for their fair share of the pie. So the affective dimension to this kind of protest does not come from feeling morally sanctified through your good efforts; it’s just what I could call ‘the subjective corollary of a real expression of political power’. It takes genuine courage to break the law at a protest for political reasons; it’s genuinely frightening and genuinely dangerous. But arguably the reasons why people turn up to a protest precede the affective element. Why attempt to psychologise the event as some cry for attention from a big father? Not only is this a dubious application of a reductive folk psychology to a complex event, it’s also a patronising condemnation of that active minority of people who get involved in real politics outside of the party electoral system. Of course, the general aim of these demonstrations is to steer governments towards more egalitarian policy decisions, and they seldom manage to overthrow capitalism in one go; but neither do they sit around and wait for other people to do their politics for them. To be a priori against public demonstrations is a useless limitation for a critical theory of resistance. PSO: Couldn’t it be said that this ‘general aim’ was the cause of the problem? The aggregate demands of the protest amounted to little more than an insipid socialist reformism, of the kind exemplified by the Socialist Workers Party. That is, a politics which is based upon the soliciting of pity and an empty promise to nurse the wounds of an anachronistic working class. Basically, the demands of the G20 Meltdown protest were either too weak or too unrealistic to inspire the people. PR: As far as I’m aware, the G20 Meltdown organisers were an original political configuration and not a covert wing of the Socialist Workers Party, or ‘the M.I.6’ as it’s known in activist circles. Although the SWP did try and reclaim the protest as their own in the aftermath of Ian Tomlinson’s death-and the cynicism by which they used his death to propagate their own cause was a particularly ugly example of Realpolitik-they did not predominate the organisation beforehand. In fact, so far as I understand it, the SWP were so miffed by their lack of influence on the G20 Protest that they decided to have their own separate and explicitly ‘peaceful’ demonstration in Trafalgar Square, far from the maddening crowd. It’s ironic that the SWP wouldn’t want to dilute their very particular demands by joining in with the masses. It’s also hypocritical to criticise the weakness of a demand without postulating any of your own. How far does one have to capitulate to the norms of the contemporary political field before one’s goal is recognised as viable? At what moment is a mass political movement able to achieve practical sufficiency in itself through unifying around a determinate goal? Does this occur before, during, or after the event? In practice, politics is too messy and ad hoc to be fully grasped by an abstract political theory. PSO: Why should the demands of the active minority who protest take precedence over the silent majority who votes and stays silent? Your position would seem to imply that we should always consider political demonstrations as the direct manifestation of an a priori emancipatory political subject. There have been moments in the past, particularly in the 1940’s, when the will of the people has been led astray. What gives the G20 protesters their legitimacy? 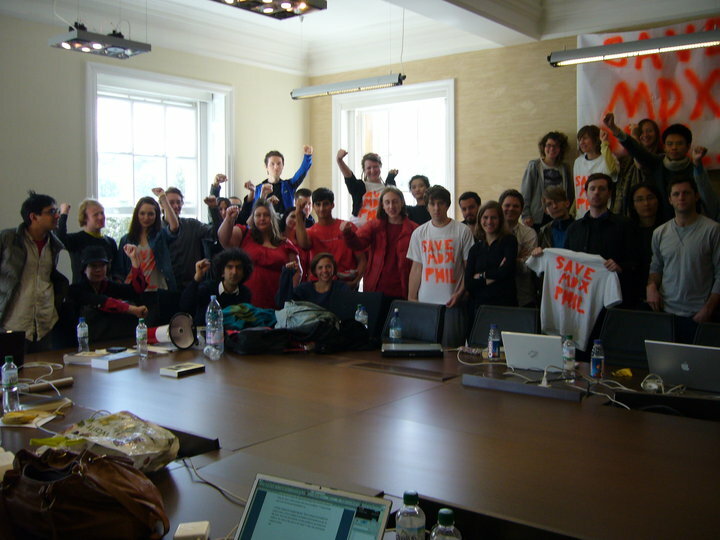 To provide an example closer to home, the London squatter movement justifies its appropriation of private property on the grounds that it aims towards a more equitable re-distribution of wealth, when in fact it could also be viewed as a de facto black market operation which takes over properties in the interest of a particular social milieu (primarily middle class students and those who can afford to risk an alternative lifestyle). For all their good intentions, these squatters effectively undermine the stringency of a democratically validated legal system for their own advantage. Whilst we can both agree that private property is a pernicious institution, it is also one which needs to be carefully dismantled. Why should we immediately advocate all political resistance as if pure anarchy were a kind of good in itself? PR: My flippant response would be to say that the only valid challenges to the institution of private property are the most expedient ones. But really, I don’t have an adequate solution to this problem. What I can say is that when I’m amongst these activist groups one quickly comes to realise that the people involved in them are not always the sharpest tools in the box, and they can be just as petty as the rest of us. But this is all politically irrelevant-I would agree with you and say that these activist groups have no privileged access to any fool-proof political theory, and if I’m honest, then I’d be afraid if some of them ever actually managed to get into a position of power. Yet I can say that many of them are very well-informed about politics, certainly more so than your average student or academic. In their defence then, it could be argued that these activist groups are self-validating to the extent that the people involved in them make the strongest political demands. This would entail a dangerous logic in which a) politics is about expressing the will of the people, b) and these activists have the strongest will, so c) their political struggle becomes justified. It sounds very un-pc to express it in this way, but politics is not a whipped-cream cake: the struggle for the new left to achieve power is not about the achievement of an ahistorical abstract good, whether you codify this in terms of an innate anarchistic tendency in humanity or the application of an ideal mathematical truth onto society. It doesn’t get you off the hook from doing the dirty work: for me, politics is a prescription based on a hypothesis which is at best grounded in the speculations of the historical method. PSO: To press you on this point, doesn’t ‘faith’ then become the ultimate motivating force behind your political activism? You have no guarantees that your political standpoint is valid, yet you justify your antagonism towards neoliberalism by the hope that something better will replace it. Isn’t this still a form of faith in the power of revolutionary politics for revolution’s sake? PR: But what is to be gained by this reduction of complex political antagonisms into a question of brute faith? All I can do is re-direct your question onto the problems of historical method: can we empirically determine the course of history and then judge where we should best channel our energies? If you are a hardworking activist for a particular political cause then it seems to me that you must have recourse to some kind of realist understanding of history which justifies your time and effort. Unless of course you are some kind of Christian existentialist and you do your good deeds for the thrill of devotion and the promise of an ideal heaven to come. But determining the course of history is no easy matter, and clearly there are serious problems with the metaphysical underpinnings of a Marxist causal history, for example. What does it mean to say that class struggle is the motor of history? This is the problem with the energetic model which underlies the Marxist philosophy as a whole: the idea that the capitalist mode of production is intrinsically wrong because it places artificial limits upon our infinite potential as a species, which is continuous with Marx’s conception of freely-given labour as man’s ultimate purpose. In both cases we can see how these ideas seem to coincide with a particular historical moment, in which the growth of industry was combined with the transformation of the Protestant work ethic. For me, it’s still the standpoint of history which provides us with the most reliable means by which we can make pragmatic prognostications about the future. Philosophy and science might function as history’s epistemological checks, while art stands in as the realm of pure speculation common to all three. So, from my limited historical understanding of our contemporary situation, I am personally convinced that the grass-roots political movements involved in the G20 Meltdown represent the emergent progressive elements within our society. The alternative position, which is to cast doubt on these movements until that theoretical breakthrough falls from the sky, seems much worse. Early on in his career as a theoretician, Slavoj Zizek would make the point that actual political movements on the left are not patiently waiting for the invention of a new theory which will justify their actions in advance. Later on, when he has grown more comfortable, Zizek will retract that point and claim that doing nothing, or ‘resisting the neoliberal injunction to act’ is the most appropriate response to our contemporary political situation. Well, this might be a little glib, but I think the solution to this political impasse will involve the simultaneous action of both theoreticians and activists. The break on activism in favour of a ‘new’ political theory, or a ‘new’ politcal strategy-which of course will have no relation to what activists are currently doing-is politically debilitating, even if it's a vain delusion to believe that the revolutionary masses are being held back by the lack of a theory. Regardless of whether the views of these activists groups can be brought into line with a teleology of enlightenment, what redeems them is the fact that they are the real social movements who are constructing new political institutions which exist outside the limited range of professional party politics. The rampART social centre was one example, and for me its very existence precluded any need for ‘faith’. To illustrate what I mean I’ll share with you some inside information: At rampART, which had for years served as a meeting place for activist groups, there was often talk about whether the building might have been bugged by the police. Some people were sure that it must have been, while others thought that the police wouldn’t bother, given that the groups who used the space posed no real threat to government. The strange thing is that I don’t think it mattered whether the building was bugged or not. Why? Because if the activist groups who operated from there were only small-scale, then the police wouldn’t have any reason to interfere, and they wouldn’t want to draw any attention to the activists' cause. 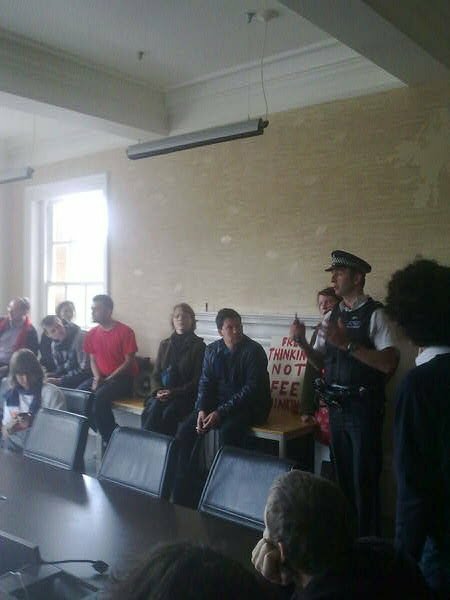 Conversely, when the building was used as a meeting place for organisers of large-scale public protests like the G20 Meltdown, the police couldn’t harass them too much beforehand for risk of creating a media-outrage. Governments are still vulnerable to the media, and this is what makes the ‘K Punk Consensus’ on the futility of political protest so egregious: it’s not just that the denigration of the G20 Meltdown is an insult to those activist groups who were involved; it’s not just that to describe police brutality as the work of a bad father inflicting signs of grace on willing protesters is distasteful, it’s rather that this neo-Adornian scepticism of the ‘pseudo-praxis’ of political demonstrations is an active factor in rendering them worthless. PSO: Adorno argued that in an age where the state has control over the culture industry and the atom bomb, it would be absurd to believe that a government would allow itself to be toppled by a few thousand protestors marching through the streets. Political protests like the G20 Meltdown are completely contained within the state system and function as a simulation of authentic resistance whilst possessing no direct impact on governmental policies whatsoever. Whatever the long term political implications of these protests, couldn’t it be argued that the immediate task of the political theorist today is to find more effective means of organisation which will have greater traction on the decisions of neoliberal administrations already weakened by the financial crisis? PR: I’d agree that political protests appear like a simulation of authentic resistance as far as their conventional media representation goes, and even when you are directly involved in a protest it’s hard to shake the paranoia that ‘all this has been arranged’. There’s certainly no doubt that at every mass protest there will be a number of agent provocateurs assigned to do things which will make the protest look bad in the media, and here one might wonder about the broken windows at the Royal Bank of Scotland. This is indisputable, a definite tried and tested police tactic. But in the same way that the state cannot afford to create the protest as a whole, they also lack the resources to fully contain it. The organisation of a large-scale public protest should be viewed as only one aspect of a spectrum of political protest, with hunger strikes and suicide bombing at one end, and petitioning your local MP at the other. Undoubtedly, the various anti-capitialist movements should try and co-ordinate their efforts and sometimes a large-scale public protest is a way of achieving this kind of practical unity, and it can also draw in new support for the left through exposing the injustice of a democratic government which has to violently stamp out public dissent. Admittedly, the aggregate demands of the G20 Meltdown protest were fairly vague and open-ended, but at least it was an organisation of something, for something. Organisation is not a good in itself. Look at the Socialist Workers Party: this party has probably the highest degree of political organisation this side of North Korea and yet it remains unsuccessful as an active force in politics. Why? Perhaps because they are more concerned with achieving a permanent inclusion within the political system as it currently stands than actively working towards real change, while all they offer in return is a miserabilist critique of how bad the world is along with the empty promise to make it a little better for the worker. If you have ever wondered what a highly organised ‘inhumanist’ politics might look like then I suggest you try having a conversation with one of their drones, and don’t forget to have your pound ready to buy their newspaper afterwards. Yet, for all that, at least their politics has some content to it, even if it’s primarily negative. Perhaps the cynicism of these neo-Adornians is worse: on the one hand, these theorists appear to lack any strong connection with grass-roots political movements (bar the respectful tilt of the cap for the odd striking factory worker), presumably because current activist group have unrealistic goals and cannot sustain a ‘practical sufficiency in itself’. On the other hand, all these theorists have to offer in return is an empty invocation to ‘organise’, without either a grand philosophical system or even a modest tactical hypothesis to back it up; whilst they still have the nerve to criticise the allegedly exorbitant demands of the protesters. Why can they not specify what their own realistic political demands might be? Perhaps they have a dim intuition that their own determinate political goals will not be theirs alone, and they’ll soon discover that many activist groups are already working to achieve these demands in practice. I’d say that their glib dismissal of the G20 protest is tied in with this: their reluctance to align themselves with actual political activists betrays a hidden desire to differentiate themselves from the people. Effectively their politics becomes little more than a posture which aims to affect politics from a safe distance. Without any positive content, political theorising just becomes a purely affective gesture, of a kind which is classically figured in Hegel’s concept of the ‘beautiful soul’. PSO: It can still be argued that the incoherencies of the demands of the anti-capitalist movement are the key factor in its current ineffectiveness, and this makes it prone to co-option by governmental rhetoric. Whilst the voice of the modern worker has been claimed by new labour, the environmentalist movement has become highly susceptible to conservative appropriation. The Climate Camp’s vague demand to ‘save the planet’ does not necessarily entail egalitarian social consequences, nor does it lend itself to any obvious political program given that there is as yet no scientific consensus on how climate change might be best tackled: everyone agrees that something should be done, but nobody knows what should be done. PR: It’s true that the environmentalist movement is greatly compromised by its lack of critical self-scrutiny; it seems obvious to me that we can only save the planet for ourselves and that we can’t really take the side of nature in a discussion, unless of course it is the nature that we want to see preserved. So when it comes to the environment at least, I’m a strict correlationist. Personally, I can’t motivate myself to struggle on behalf of the planet in order to provide beautiful scenery for rich people to lose themselves in. Maybe if there was a trap of some kind...But seriously, it’s difficult to avoid the impression that the greens are mainly just a bunch of complacent middle-class liberals with a sentimental approach to politics. Why should I care if ‘the polar bears are drowning’ when I’m forced to work sixty hours a week in a mind-numbingly boring job, just to pay the bills? Meanwhile another section of society has the moral luxury of buying organic food out of consideration for the polar bears. The counter-argument from the greens would be that they are the only ones actively trying to preserve the bio-diversity of life on earth so that we might all still be around to appreciate it in a few more years. For them, the old divisions between right and left no longer matter in the face of imminent environmental catastrophe brought on by climate change. Frankly, I think they are right: finding ways to address global heating and the energy crisis is not only our most pressing challenge as a species, but it is also the challenge which has the most potential to unite us on a global scale, in a way which would be inconceivable only fifty years ago. The danger is that these issues get reduced into a kind of greenwash ideology which achieves little more than making middle class consumers feel better about themselves for buying ‘organic food’ or ‘renewable energy’. As an interesting case in point, James Lovelock’s work straddles both sides of this problem. Primarily Lovelock’s name is associated with his ‘Gaia Theory’, which argues that the earth should be viewed as a single organism which strives to make itself more hospitable for new life. Whilst in practice, Gaia theory is compatible with a kind of cybernetics approach to biology, the definite theological implications of Lovelock’s concept of Gaia have been used to license the now familiar new-age mysticism about saving the planet. Yet on the other hand, I think you’ll be hard pushed to find a contemporary scientist who is more anti-humanist, at least in the literal sense of the term: Lovelock is stoically resigned to the fact that approximately eighty percent of the human population will die out within the next hundred years as a consequence of global heating, and believes there’s very little that we can do about it. His fierce naturalism won’t allow him to take seriously any collective political acts against climate change, comparing such a possibility with the likelihood of convincing a shark to become vegetarian by sheer effort. I find his anti-utopian stance on humanity refreshing in terms of its critique of greenwash ideology, which finds its perfect symbol in the well-intentioned but practically useless wind turbines which litter the landscape like a contemporary version of the crucifix. But for all his scientific credentials, Lovelock’s standpoint amounts to a form of political quietism, which at best functions as a warning and an incitement to deal with the colossal environmental problems which cannot be solved through piecemeal reform. At worst, it lends itself to a potential neo-fascism with a politics which accepts that those who are lucky enough to be born on one of the islands which will escape the immediate consequences of climate change should do all they can to protect its borders from the desperate hordes who will soon be seeking sanctuary there. Faced with this alternative, I’d prefer to endorse those who argue for more drastic re-constructions of species-being, ones which will utilise all the technological resources we can get our hands on. But the problem comes when we try and find the rational justifications by which such a re-construction of the species can take place: if, as a strict naturalist, you don’t believe that human beings can be subjectively free, then what’s the point in freeing the people? Why amplify our human capacities through technical prosthesis unless you believed that the resulting increase will yield a greater potential for the development of life as a whole? And here it makes little difference whether you codify this concept of life in terms of ‘a culture’, or ‘a science’, or ‘the singularity’, such a privileging of the species along with its consequent teleology would I think be a difficult position for a strict naturalist to uphold: the constructive force of law always impinges on any dream of a natural justice, and scientists who have political convictions would do well to remember Bizmarck’s quip about ‘laws being like sausages: it’s best not to see them being made.’ To return back to your question, I think the Climate Camp at the G20 Meltdown serves as a good example of the two contradictory tendencies within the environmentalist movement in general. On the one hand it stands for the expanded moral demands of a wealthy middle-class who can afford to grow sentimental over the fate of the polar bears, and on the other, protests like Climate Camp are laying the basis for what will be the most significant political movement of the next century; one which radically questions our nature as a species and explicitly demands the conscious re-construction of society as a whole if we are to survive the environmental crisis. PSO: To end on a positive note, in your opinion what are the main opportunities which our current situation offers to a potentially combustible new left? PR: I think our current situation offers us two main tendencies which are ripe for appropriation. Firstly, as we’ve already discussed, there’s the impending environmental crisis: whilst everyone can agree that something must be done to prevent climate change, many are as yet unaware of the severity of the problem and fail to realise that any potential solution will involve co-ordinated efforts on a global scale. The necessity of this global co-ordination is highly significant for a leftist politics, for the obvious reason that it’ll have to counter the fatalism of naturalists like Lovelock, and simultaneously expose the myth of the free-market as man’s natural predisposition. Arguably, it’s these twin ideologies-what Marx would call ‘the physiocratic illusion’-which do the most to sustain late capitalism. These days, the popular idea of communism is still severely tarnished by its association with the real failings of a planned economy along with the widespread environmental damage caused by rapid over-industrialisation in the socialist states. Yet any proposed solution to the global environmental crisis will demand a kind of collective labour on a scale which will make the soviets seem like a modest experiment in comparison. Perhaps popular support for an idea of communism might return around the same time as the new left overcomes its cynicism towards the environmentalist movement. Secondly, the exponential growth in communicative technology provides the new left with the possibility of bypassing the older state supporting media and creates a new form of human socialisation. This is not to say that the world has already become communist along the lines of those who would argue that the ‘multitude’ now ‘subjectively’ owns the dominant means of production through their affective labour. Instead, it’s more a question of how this new technology might be utilised as a medium through which the left can rapidly mobilise and alert the public to injustice-basically, I think it’s an extremely powerful tool which hasn’t yet been fully exploited, and it provides a perfect forum from which the new left can develop its own political theories in tandem with the growing popular demands for social change. PR: Yes, the NATO summit demonstrations that took place in Strasbourg made the G20 protest in London seem like a day out in kindergarten. Salute to all those who endured the tear gas, stun grenades and rubber bullets to make their point. See Alena Ledeneva’s Russia’s Economy of Favours for an analysis of how the soviet planned economy depended upon an internal freemarket of private favours. The concept of ‘Blat' derives from the colloquial Russian expression for the black market and is used by Ledeneva as a network concept which combines an economic determinable response to the intrinsic shortfalls of the soviet system with an emergent potential for subjective resistance. Section 76 of the Counter Terrorism Act allows ’the police to criminalise photographers in certain, but by no means arbitrary cases’, on the grounds that the identity of police officers will need to be protected from the threat of terrorist reprisals. See Kypros Kyprianou’s activist-artwork, ’A Restless State’ for a brilliant détounement of Section 76. Adorno’s concept of ’pseudo-praxis’ designates forms of political activism such as student protests, which are undertaken for subjective reasons alone and fail to effect the objective conditions of society at large. See his essay, ’Marginalia to Theory and Praxis’ available in the Critical Models collection. See Lovelock’s ‘The Vanishing Face of Gaia’ for a controversial popular science account of climate change. …A great pincer movement which whittles down contemporary philosophy to the size of a pinhead. 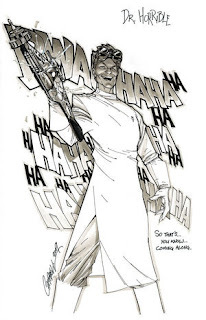 The danger is that such a procedure will leave philosophy with all the contemporary relevance of a scholastic debate concerning the number of angels who’ll fit on a pinhead, regardless of whether or not mathematisation makes them more 'real'. Of course this appeal to common-sense can easily be dismissed on formal grounds alone, as proof of my 'anthropomorphic myopia' or naivé 'correlationalism'. Nevertheless, I hope the following response to the set of extraordinary claims contained in the revised version of Brassier’s Genre is Obsolete will generate a lively discussion; it has at least forced me to clarify, develop, and expose my own position to similar critical scrutiny. On a personal note, I was one of those graduate students at Middlesex University who were lucky enough to have had the pleasure of Dr. Brassier’s teaching, and I can confirm that his genius for philosophy is easily matched by his brilliance as a teacher. Many of the ideas in the following post (particularly those concerning the contemporary significance of Schiller) can be directly attributed to his lessons, whilst all the errors are mine alone. Rigorous critique is perhaps the best compliment for a philosopher, and it is this sentiment which motivates the following post. 20. What remains of the good after the elimination of the beautiful? Following Brassier, we can ascribe the category of aesthetic experience to all that is (subjectively) wrong with the world; thus aesthetic experience is confined to an ideological form which can be overcome through the cold wisdom of knowing our objective limitations. The originality of this position lies in the way it eschews any appeal to the idealist notion of subjective freedom as manifested through direct intuition. The weakness is that it still remains at the level of ideology, with a critique of false consciousness which fails to account for its own production. If, as Alex of 'Splintering Bone Ashes' has noted, the alleged anhedonia of Thomas Ligotti is compromised by the pleasure he takes in writing (even if that pleasure is re-configured as the drive to share his own 'displeasure' with the world), then Brassier's critique of aesthetic experience might be compromised by the need for a subject who 'speculates', with speculation thereby becoming the de facto mode of privileged experience. The alternative challenge may be to re-invent 'aesthetic experience' as a stand-in descriptive term for the processes by which the subject raises itself above their objective determinations through a) coming to know them, and b) experimenting with the possibilities which this new knowledge makes available. Whereas the epistemological constraint upon this 'aesthetic education' could derive from the practice of empirical history, broadly understood as the objective means by which we can distinguish the reproduction of previous determinations of social-being from the invention of new modes of life, as realised in the material expressions of a culture.